55 sqm apartment, west facing in the center of Cauterets. Ground floor. Living room with open kitchen: hob (3 burners), large fridge, microwave, oven; dishwasher, raclette grill, filter coffee maker, toaster. TV area with sofa and dining area with an extending table. A room with two beds 90 and a wardrobe. A room with a 160 bed desk, wardrobe and chest of drawers. A sleeping area with two beds 90 bunk with storage and a water point. Shower room with a shower, sink is towel dry. Separate toilet. Ski closet at the entrance of the residence. Tourist tax: 0. 90 € / day / pers. over 18 years old. The residence Boulevard is located in the center of Cauterets, close to all amenities, restaurants, swimming pool, spa, ice rink, cinema, ski hire. Ideal winter, 600 m from the gondola that takes you to the slopes of the Cirque du Lys, it enjoys a location "everything on foot". Services in option and at preferential rates: sheets, towels, WiFi box, cot, high chair. Pass 2 hours at the baths of the rock (thermoludique). 55 sqm apartment, west facing in the center of Cauterets. Ground floor. Living room with open kitchen: hob (3 burners), large fridge, microwave, oven; dishwasher, raclette grill, filter coffee maker, toaster. TV area with sofa and dining area with an extending table. A room with two beds 90 and a wardrobe. A room with a 160 bed desk, wardrobe and chest of drawers. A sleeping area with two beds 90 bunk with storage and a water point. Shower room with a shower, sink is towel dry. Separate toilet. Ski closet at the entrance of the residence. Tourist tax: 0. 90 € / day / pers. over 18 years old. The residence Boulevard is located in the center of Cauterets, close to all amenities, 200 m from the thermal César, 200 m from the Egg Esplanade, carousel, cinema and mini-golf, and departures from many hikes or the shuttle to the Pont d'Espagne. Services in option and at preferential rates: sheets, towels, WiFi box, cot, high chair. Pass 2 hours at the rock bath (thermoludique). 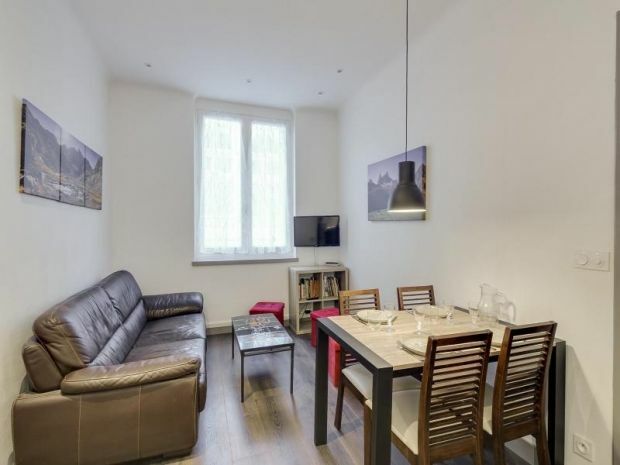 Appartement refait à neuf, spacieux, très bien insonorisé et situé idéalement en ville et au pieds des œufs. Prendre un parking payant conseillé.